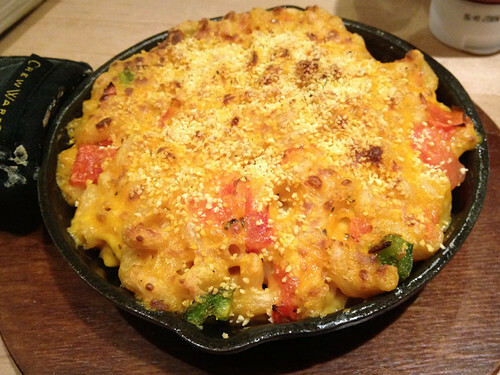 The best thing I ate this month that wasn't a veggie burger was the ultimate comfort food: vegan macaroni and cheese! My friend Michelle wanted to get macaroni and cheese for her birthday, so we met at the 33rd Street S'Mac location. I hadn't eaten at S'Mac since before I started avoiding dairy, so this was my first time trying their vegan option. I was sad to see that their iconic macaroni styles are not available in vegan versions (I really wanted a vegan version of the masala Indian spiced macaroni! ), but you do get to choose from different options to customize your macaroni - so I ordered mine with buffalo hot sauce, tomatoes, jalapenos, and breadcrumbs. I've heard so much about this place, but have never been. Wonder why they can't parlay all of the flavors into veganized versions?